I apologize for my hiatus and I’ve been taking the time to enjoy my summer, enjoying the delicious produce of this season and giving myself an overall rest. One of the most important things in this season of beautiful weather, is knowing when to take time to rest and rejuvenate. I’ve been doing just that. Of course, I’ve been in the kitchen getting a feel for seasonal cooking so I’ve decided to make my return and share a classic recipe that is a go to in my home. And, the more I make this the better it tastes each time. So start salivating and dreaming about Indian cuisine, because I’m about to set your taste buds aflame. In a deep pot, heat oil or ghee. Add cumin seeds. When cumin seeds start to pop, add onions and garlic. Stir until translucent. Season with sea salt. Add turmeric, chili powder, coriander powder, garam masala. Stir until onion is coated. Toss in potatoes and stir. Allow to cook for up to 4-5 minutes until coated with spices. Add cauliflower florets, sea salt, and stir until coated. Cover the pot and allow the vegetables to cook up to 10 minutes. After 10 minutes toss in diced tomatoes and tomato paste. Scrape the bottom of the pan to prevent sticking. (Note: if the veggies stick, add a few tablespoons of water and the veggies should release from the bottom). Continue to cook until the veggies are soft (an additional 10 minutes). Remove from heat, stir in lemon juice and cilantro. Season with salt to taste. Serve immediately with raita (recipe to come-not vegan! ), steamed basmati rice or your favorite Naan, Parantha or Roti. P.S. 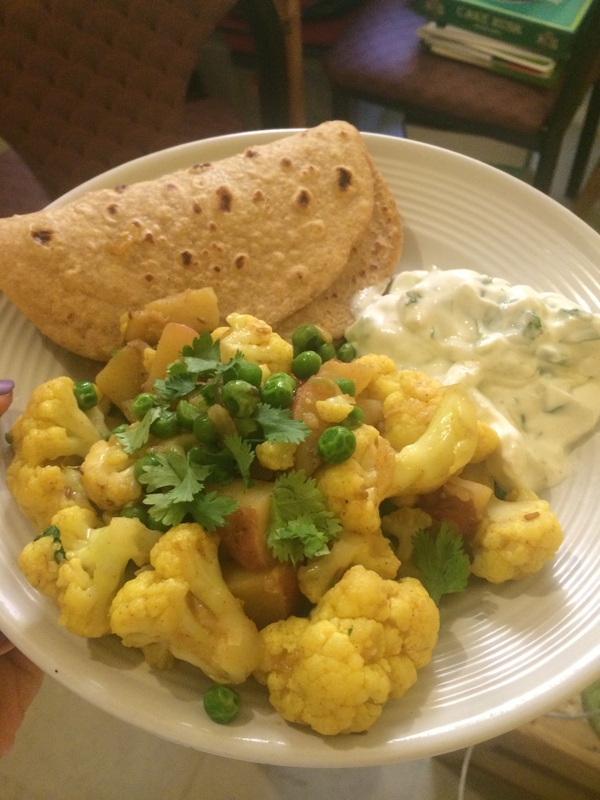 You can always add peas to your recipe (as pictured above) or simply make this Aloo Matar or Gobi Matar! This spice combination can transform any dish into something Indian! How awesome is that?! The best part about this recipe? It’s even better the next day or a few days later. You know what that means! LEFTOVERS GALORE! I definitely packed this for my boyfriend’s lunch on some basmati rice. He definitely had a happy tummy. I hope you enjoy this recipe and start cooking Indian food more often.